Photo: Courtesy of Soap Stones. Bar soaps get a pretty bad rap in the world of cleansing for a few reasons. The main issue, though? They're kinda ugly — and who wants to leave out a gross, slimy hunk on their cute soap tray? The solution: soap stones. Inspired by naturally occurring gemstones and metamorphic rock, these bar soaps are shaped like they just fell out of the side of a mountain. 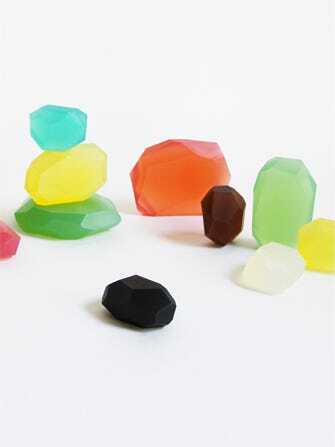 They come in three different sizes: nugget, stone, and rock, and each of the colors represents a different gemstone (rose quartz and aquamarine) or rock (jade and onyx). But, they're more than just pretty. Each bar is infused with essential oils to give it a light, yet unexpected, scent. One of my favorites is the amber stone, which smells of cedarwood — an unexpected fragrance for a hand soap. There's even an unscented version for people who don't want a smelly lather. I love these for a few reasons. Aside from being a lovely addition to my New York City apartment bathroom, they also make for an incredible hostess gift. And, since they already have an uneven shape, the more you use them, the better they look. Leave it to Geology 101 to seriously raise the bar-soap game. Pelle Soap Stones, $17.50, available at Tilde.